Spotted lanternfly (Lycorma delicatula) is an invasive planthopper that was first detected in Pennsylvania in September, 2014 (Dara et al., 2015) and believed to have arrived as eggs attached to stone in a shipment of stone from Asia. This pest is native to China and has been reported in some other Asian countries. Since its first occurrence in Berks County in Pennsylvania, it has now spread to 13 counties in the state and was also reported in Delaware and New York in November, 2017 and in Virginia in January, 2018. Fruit trees (apple, apricot, cherry, peach), ornamental or woody trees (birch, lilac, maple, poplar, tree of heaven), and vines (grape) are among more than 70 species of hosts that are infested by spotted lanternfly. The tree of heaven (Ailanthus altissima) is a favorite of the spotted lanternfly. Several invasive pests such as the brown marmorated stink bug and the Asian citrus psyllid first found in late 90s in Pennsylvania and Florida, respectively, have spread to other states and are now found in California. Considering its current distribution of the spotted lanternfly in Pennsylvania and other states and its potential to spread to other states, this article provides an update on recent efforts to monitor and control this pest. Eggs are deposited in masses and covered by a waxy substance. There are four nymphal instars. Female lanternflies are larger than males. Nymphs and adults feed on the phloem and excrete large volumes of liquid. 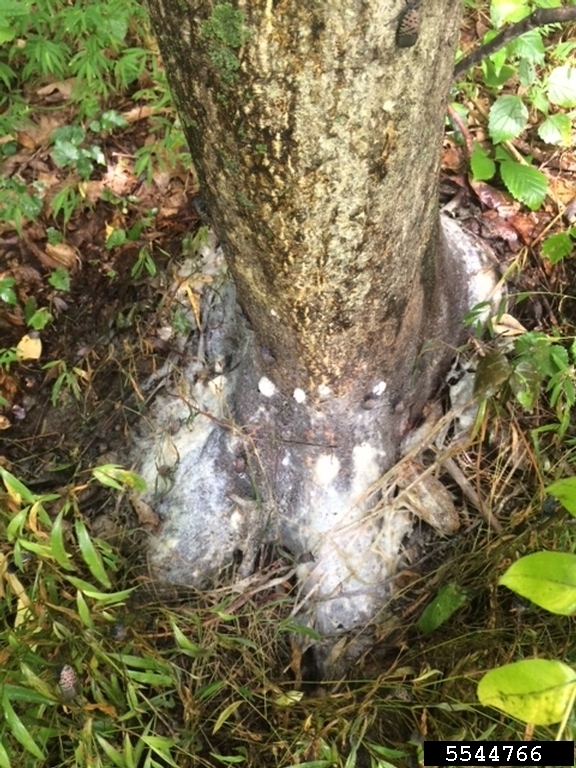 Severe feeding damage results in oozing wounds on the trunk, and wilting and death of affected branches. Egg masses of the spotted lanternfly. Photo by Lawrence Barringer, Pennsylvania Department of Agriculture. Fourth instar nymph of the spotted lanternfly. Photo by Lawrence Barringer, Pennsylvania Department of Agriculture. Adult spotted lanternfly infestations. Photo by Lawrence Barringer, Pennsylvania Department of Agriculture. White mold developing on the excretions of the spotted lanternfly. Photo by Lawrence Barringer, Pennsylvania Department of Agriculture. Preventing the movement: To prevent the spread of the spotted lanternfly, carefully inspect potential sources such as woody plant debris, yard waste, plants, or other objects. Destroy or disinfest the sources as appropriate to prevent the spread of the pest. 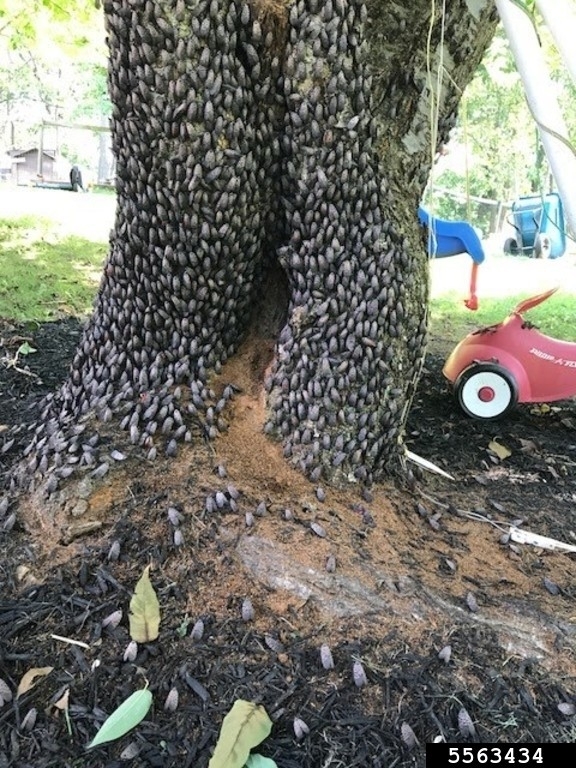 Removal of the host: Removing tree of heaven, a favorite host of the spotted lanternfly and an invasive species of tree, can reduce the risk of pest infestation and spread. 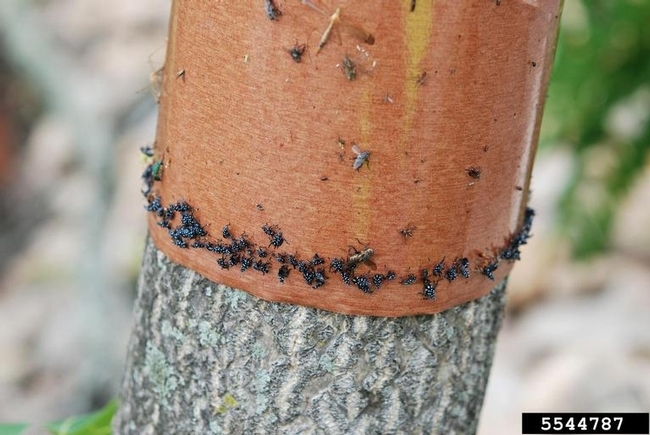 Reducing the plant stand to 15% is considered a primary strategy for preventing the spread of spotted lanternfly. The tree should be removed with its entire root system when possible. If the tree was cut, its stump should be treated with herbicides to prevent regrowth. Care should be taken while removing the tree of heaven since the toxic plant sap can cause skin irritation, headaches, nausea, and in some cases cardiac problems. Sumac and black walnut trees also look similar to the tree of heaven, but when bruised, the leaves of the latter give out a rancid peanut butter odor. Sticky bands: The Pennsylvania Department of Agriculture placed 13 counties under quarantine and is currently providing sticky bands for volunteers participating in the monitoring program to place on trees. Sticky bands are placed around the tree trunk about 4' from the ground to trap the nymphs and adults that are moving around. While younger nymphs can be captured on less sticky bands, stickier bands are necessary to capture older nymphs and adult hoppers. Those not participating in the volunteer program can purchase sticky bands or sticky substances from commercial vendors or make their own by wrapping a tape around the trunk and applying petroleum jelly or other materials on the tape. This strategy helps to detect and trap the pest infestations. More than 1.7 million spotted lanternflies were reported to be trapped in 2017 in Pennsylvania using sticky bands. Spotted lanternfly nymphs and some adults trapped on a sticky band. Photo by Lawrence Barringer, Pennsylvania Department of Agriculture. Pesticides: Contact insecticides, bifenthrin and carbaryl and systemic insecticides, dinotefuran and imidacloprid appear to be effective in controlling the spotted lanternfly based on the studies conducted in Pennsylvania. Neem oil and insecticidal soap also provide some control. However, pesticide applications appear to be a short-term solution as they cannot prevent reinfestation. 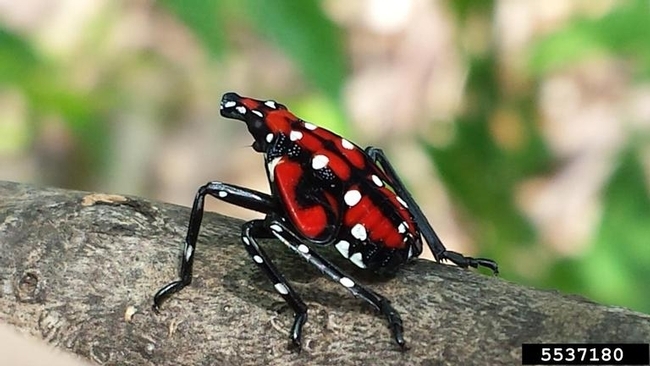 Biocontrol agents:It is thought that toxic metabolites in the body of the spotted lanternfly and its brightly colored hindwings tend to deter general predators from feeding on the pest. However, the predatory wheel bug, Arilus cristatus (Hemiptera: Reduvidae) and stink bug, Apoecilus cynicus were found feeding on adult spotted lanternfles in Pennsylvania (Barringer and Smyers, 2016). Some egg parasitoids were also reported to be attacking the spotted lanternfly in China (Choi et al., 2014) and South Korea (Kim et al., 2011). 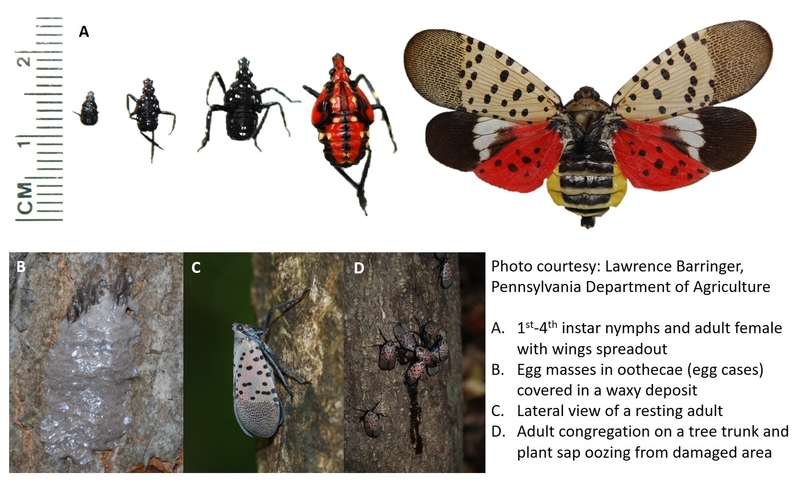 Liu and Mottern (2017) found Ooencyrtus kuvanae, an egg parasitoid imported for controlling the gypsy moth (Lymantria dispar), attacking the egg masses of the spotted lanternfly in Pennsylvania in 2016. These native predators and introduced parasitoids could be potential biocontrol options for the spotted lanterfly. Microbial control agents: Entomopathogenic fungi Beauveria bassiana, Isaria fumosorosea, and Metarhizium brunneum may also play a role alone or in combination with azadirachtin for controlling spotted lanternfly and researchers should explore microbial control. Choi, M. Y., Z.Q. Yang, X. Y. Wang, Y. L. Tang, and Z. R. Hou. 2014. 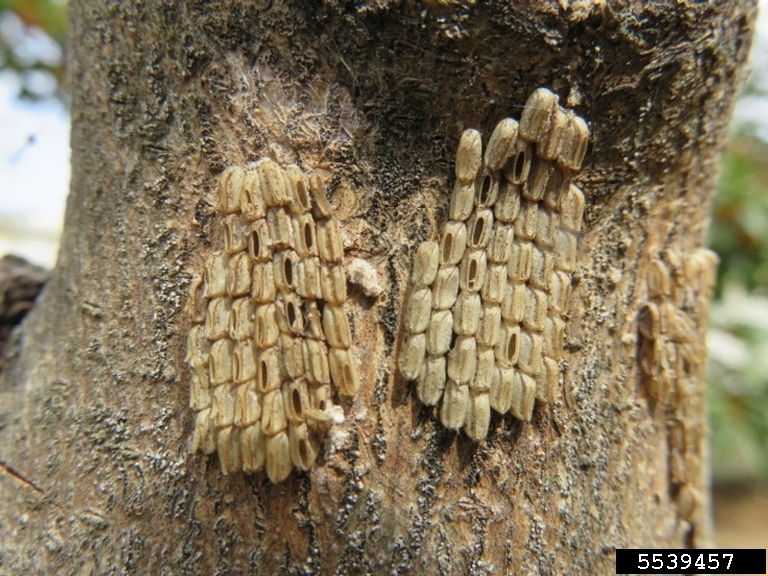 Parasitism rate of egg parasitoid Anastatus orientalis (Hymenoptera: Eupelmidae) on Lycorma delicatula (Hemiptera: Fulgoridae) in China. Korean J. Appl. Entomol. 53: 135–139. Kim, I. K., S. H. Koh, J. S. Lee, W. I. Choi, and S. C. Shin. 2011b. Discovery of an egg parasitoid of Lycorma delicatula (Hemiptera: Fulgoridae) an invasive species in South Korea. J. Asia Pac. Entomol. 14: 213–215. 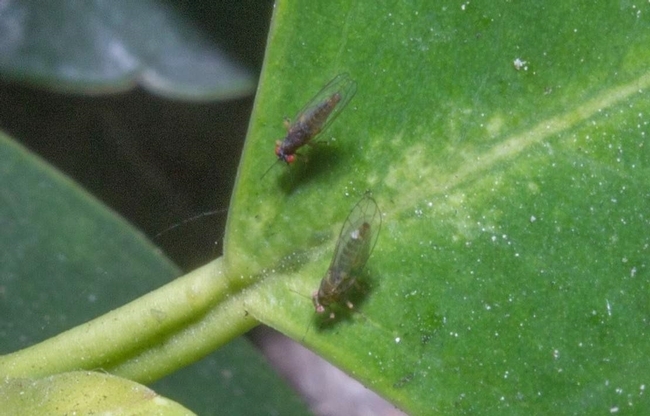 A psyllid, perhaps new to the Western Hemisphere, has been found on Ficus microcarpa (Chinese banyan, Indian laurel fig) in Los Angeles, Orange, San Bernardino, Ventura, San Diego, and Riverside counties. It causes a distinctive, tight, and typically complete rolling of the leaves. 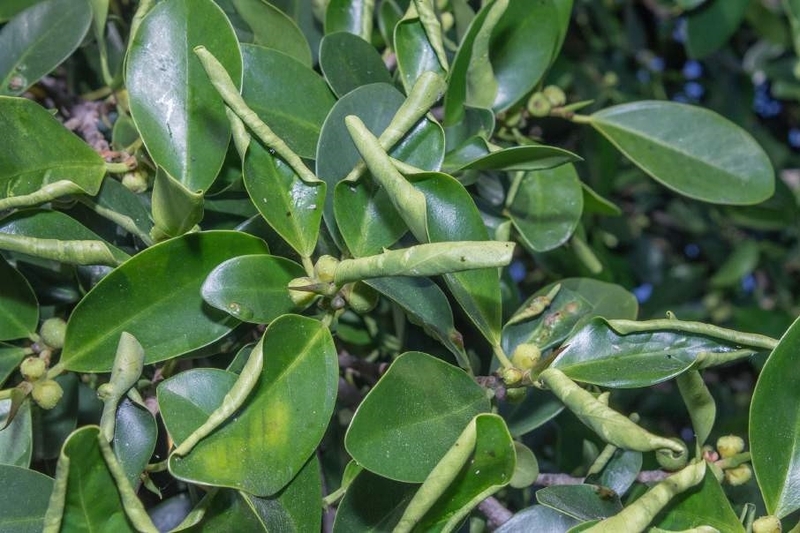 Ficus microcarpa is one of the most common, useful, and widespread ornamental landscape trees, and has long been a target for numerous pests. 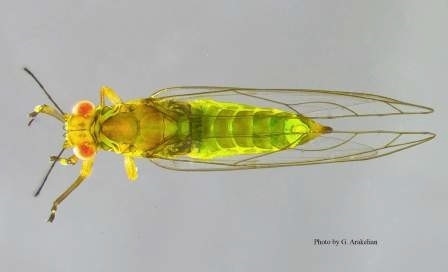 Alessandra Rung, an entomologist and thrips specialist at the California Department of Food and Agriculture, with the help of Daniel Burckhard, a psyllid specialist at the Natural History Museum of Basel, Switzerland identified the psyllid as Trioza brevigenae Mathur. This psyllid does not have a common name and we refer to it as the ficus leaf-rolling psyllid (FLRP). FLRP belongs to the family Triozidae in the order Hemiptera. 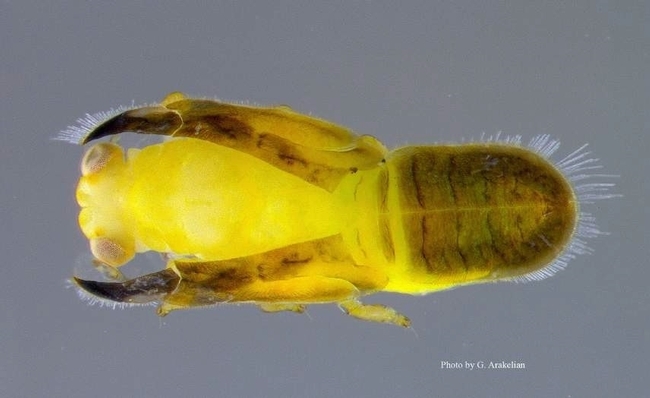 Triozids are commonly known as tip sheet fleas and along with the members of seven other closely related families, they are also referred to as jumping plant-lice, which is a psynonym for psyllids (Burckhardt and Ouvrard, 2012). 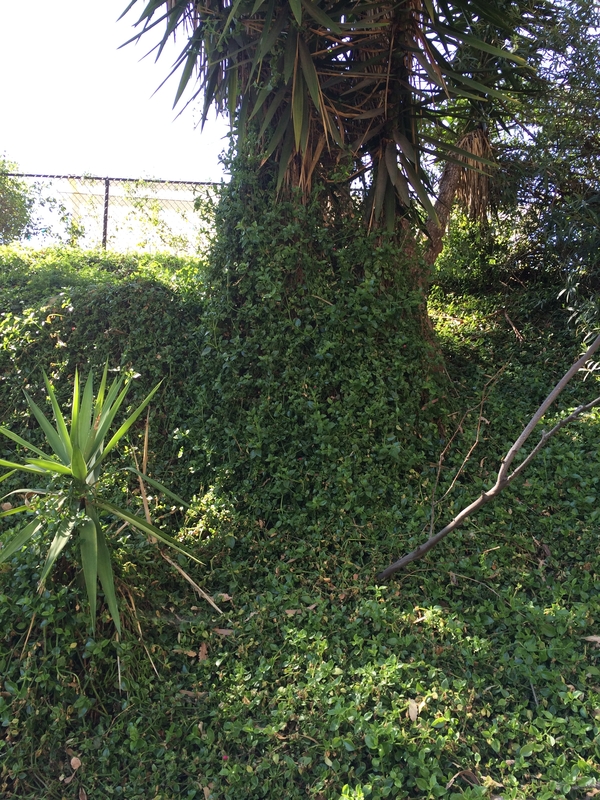 FLRP was first detected by coauthor, Linda Ohara on trees in Carson south of Los Angeles in February, 2016 during a routine survey of pests on F. microcarpa (sometimes erroneously referred to as F. nitida or F. retusa)and later observed in several areas including western Los Angeles, Pasadena, Duarte, LongBeach, Lakewood, Claremont, and Universal City (San Fernando Valley) in Los Angeles County; Irvine and Anaheim in Orange County; Thousand Oaks in eastern Ventura County; Oceanside in northern San Diego County; Montclair in western San Bernardino County; and Corona in western Riverside County. It is likely widespread, perhaps even outside this six-county area. FLRP is native to India and is not reported from anywhere else in the world (Hodkinson, 1986; Ouvrard, 2013). It is one of the 22 Trioza spp. in India (Yang and Raman, 2007; Ouvrard, 2013). It is not clear how it arrived into the US, but the infestation appears to be a recent one as damage was not observed during a previous survey in January, 2016. FLRP causes a distinctive leaf-rolling of newly developing leaves are tightly rolled into a narrow cylinder, compressed to a diameter of 3-5 mm as they mature. Leaf rolling is conspicuous on heavily infested trees. Rolling appears to begin at the distal end or apex of the leaf and progresses adaxially along each margin towards the leaf base. In some cases, only one margin rolls and stops at the midrib of the leaf. Damage leaves are brittle, but remain green when only FLRP is present. 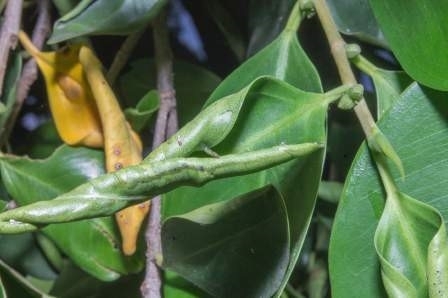 Other pests such as mealybugs and the leaf gall wasp, Josephiella microcarpae might also be present in the rolled leaves and cause discoloration or further deformation. The tight leaf rolling of FLRP is distinct from the loose curling or folding from the Cuban laurel thrips, Gynaikothrips ficorum or the folded-leaf galls caused by the weeping fig thrips, G. uzeli, which also cause reddish scars on the damaged leaves (Dara and Hodel, 2015). Spiders and other insects may also cause loose leaf rolling that can be easily distinguished from FLRP damage. 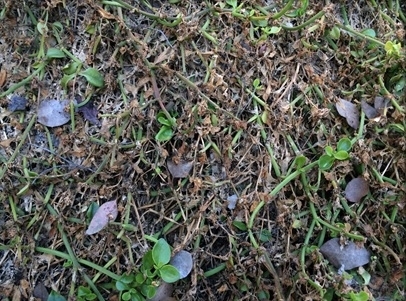 Information on the severity or the extent of damage caused by FLRP is not clear, but under severe infestations excessive leaf rolling could affect photosynthesis and thus the plant health. As seen in some specimens, leaf rolls might also harbor secondary pests. Information on the biology of FLRP is lacking in scientific literature. Adults are 2.6-2.8 mm long with brownish green head and thorax, and protruding red eyes. Abdomen is green in young adults and turns brown with maturity. Wings are 3 mm long, transparent with no color pattern, and extend beyond the posterior end of the abdomen. Females are larger than males. Adults are typically found outside and adjacent to the rolled leaves. 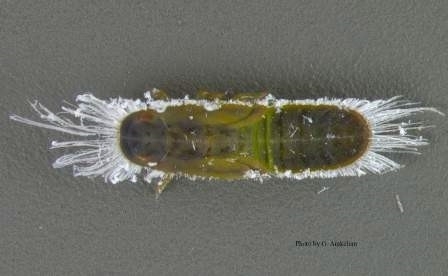 Nymphs are mobile, 1-2.5 mm long, and oblong with dark greyish tan bodies that turn brownish or brownish green with age. Advanced nymphal instars have skirts of long, white, waxy filaments at cranial and caudal parts of their bodies. Wingpads are also visible in latter instars and are extended anteriorly close to the eye level. Eggs were not found during the observations. 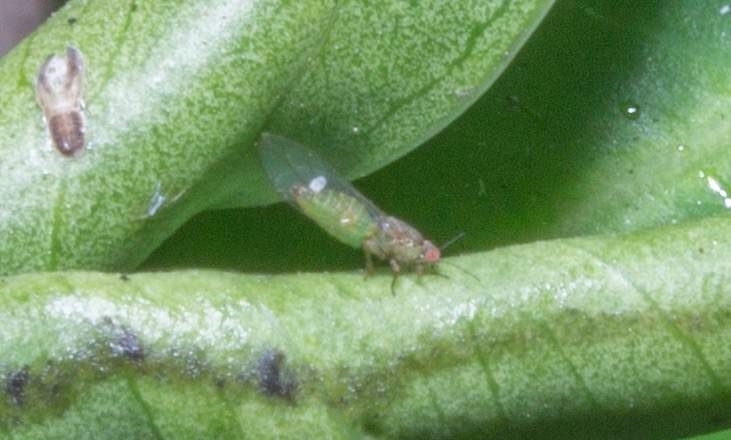 Like many psyllid species, FLRP aligns its body at a 45 degree angle to the leaf surface with a raised abdomen. It moves the abdomen sideways like a dog wagging its tail. In a peculiar behavior that FLRP exhibited, adults extended the wings until they are at a right angle to the body and then waved them back and forth. Being a tropical pest, FLRP was more detectable during warmer (25-30oC or 76-86oF or more) and still weather than during cooler, cloudy, and breezy weather conditions. No information is currently available about the management of FLRP. 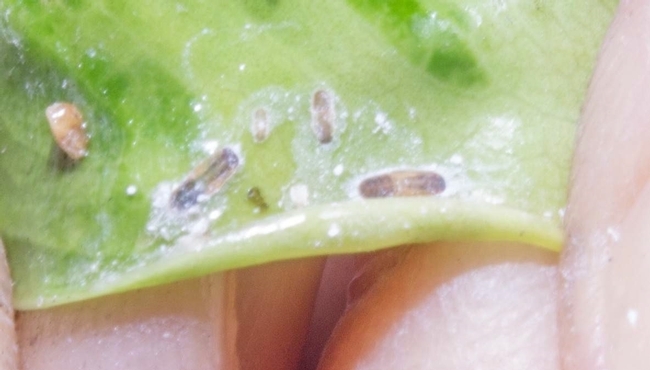 Leaf-rolls are likely to protect the immature stages from contact insecticides and possibly from some common natural enemies. Although wings, lady beetles, and minute pirate bugs were found on the foliage of the infested trees, their role as potential biocontrol agents is not clear. Initial observations indicated that infestations were higher on trees with younger leaves. Since FLRP appears to have a tendency to infest newly emerging leaves, careful scouting and removal (and bagging) of the infested leaves can help reduce the spread of infestations. Depending on the level of infestation and life stages of the pest, contact insecticides for adults and systemic insecticides against immature stages can be considered. Ficus microcarpa cultivars Green Gem and Variegata, which are resistant to some pests, does not seem to resist FLRP. If you see FLRP infestations contact your local UCCE or Ag Commissioner's office. You may also contact me at 805-720-1700 or skdara@ucdavis.edu to help me track the distribution of the pest. This article was based on the original article by Hodel et al. (2016) published in the e-journal, PalmArbor (http://ucanr.edu/sites/HodelPalmsTrees/files/242336.pdf). Dara, S. K. and Hodel, D. R. 2015. 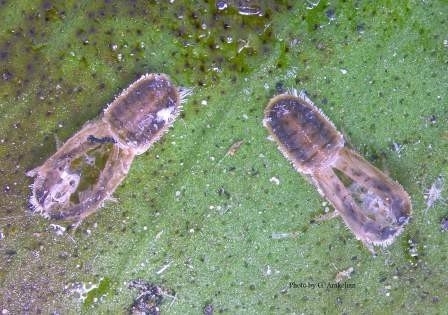 Weeping fig thrips (Thysanoptera: Phlaeothripidae) in California and a review of its biology and management options. J. Integ. Pest Mngmt. 6: 2; DOI: 10.1093/jipm/pmv001. Hodkinson, I. D. 1986. The psyllids (Homoptera: Psylloidea) of the Oriental Zoogeographical Region: an annotated check-list. J. Nat. Hstory 20: 299-357. Hodel, D. R., Arakelian, G., Ohara, L. M., Wilen, C. and Dara, S. K. 2016. The ficus leaf-rolling psyllid: a new pest of Ficus microcarpa. PalmArbor 2: 1-9. Yang, M.-M. and Raman, A. 2007. Diversity, richness, and patterns of radiation among gall-inducing psyllids (Hemiptera: Psylloidea) in the orient and Eastern Palearctic. Oriental Insects 41: 55-65. Donald R. Hodel, Landscape Horticulture Advisor, University of California Cooperative Extension, Los Angeles. Gevork Arakelian, Entomologist, Los Angeles County Agricultural Commissioner/ Weights & Measures in South Gate, CA. Linda M. Ohara, Biological Science Lab Technician, El Camino College in Torrance, CA, a horticulturist, and a former nurserywoman. Surendra K. Dara, Strawberry and Vegetable Crops Advisor, University of California Cooperative Extension. Cheryl Wilen, Area IPM Advisor, University of California Cooperative Extension, San Diego, CA. A downy mildew caused by the oomycetous fungus, Peronospora mesembryanthemi Verwoerd has recently been confirmed by the USDA -APHIS from a red apple ice plant sample collected in San Diego. Since its first finding in San Diego County last summer, the disease has spread to Orange, San Bernardino, and Ventura counties and is now found in the Goleta area in Santa Barbara County. Peronospora mesembryanthemi was first reported from South Africa (Verwoerd, 1924) and later in the United Kingdom (Francis and Waterhouse, 1988) and New Zealand (McKenzie and Dingley, 1996), but has never been reported in North America. 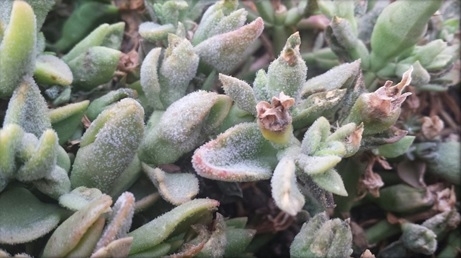 The host range of P. mesembryanthemi is thought to be limited to ice plants and it is currently found infecting the red apple ice plant, Aptenia cordifolia, the trailing ice plant or the pink carpet, Delosperma (syn. Mesembryanthemum) cooperi, and Lampranthus sp. in California. 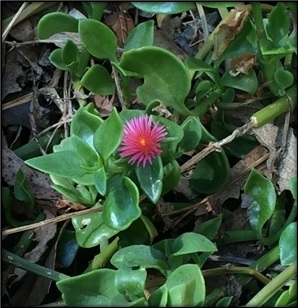 Both these ice plant species are native to southern Africa. Because of their environmental hardiness, ease of growing, and bright, colorful flowers, ice plants are grown as ornamental plants or found as groundcovers. However, the red apple ice plant is listed as an invasive plant by the California Exotic Pest Plant Council. It can sometimes grow like a weed. Pathogen: Downy mildew appears as a mat of grey, blue, or brown fungal growth on the lower or both sides of leaves and other infected plant parts. Fungal growth consists of the asexual fruiting structures known as sporangia that are produced on sporangiophores, which are specialized hyphae. Downy mildew fungi cause systemic infection and grow internally in all plant parts. Infection rapidly spreads under cool and wet conditions. Windblown rain or sprinkler splashing spreads disperse sporangia and aid in the disease spread. Downy mildew fungi are obligate parasites of plants and most of them have narrow host range of one or just a few hosts. Greyish sporulation of Peronospora mesembryanthemi on an ice plant. Photo by Jose Rodriguez, Soil and Plant Laboratory, Inc.
Damage: The rapid spread of P. mesembryanthemi through southern California could be from accidental movement of infected nursery stock. 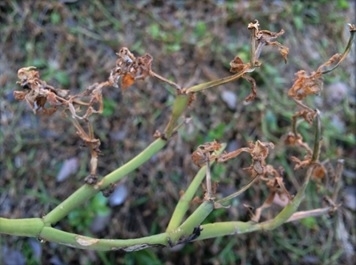 Severe damage with heavy or total loss of plantings is becoming common in southern California counties where the disease is currently found. Prune plants regularly and remove weeds to improve air circulation and reduce fungal growth. Avoid overhead irrigation during cool weather. Consider watering in the morning hours so that plants dry during the day. Do not over- or under-fertilize as it may increase the chances of infection. Monitor highly susceptible species like the red apple ice plant and remove and destroy plants with symptoms of infection. Consider other host plants as groundcovers when replacing diseased ice plants. Francis, S. and G. Waterhouse. 1988. List of Peronosporaceae reported from the British Isles. Trans. Brit. Mycol. Soc. 91: 1-62. McKenzie, E.H.C. and J. M. Dingley. 1996. New plant disease records in New Zealand: miscellaneous fungal pathogens III. New Zealand J. Bot. 34: 263-272. Verwoerd, L. 1924. Peronospora mesembryanthemi n. sp., die oorsaak van ‘n donsige skimmelsiekte van Mesembryanthemum-soorte. Ann. Univ. Stellenbosch 2A: 13-23. 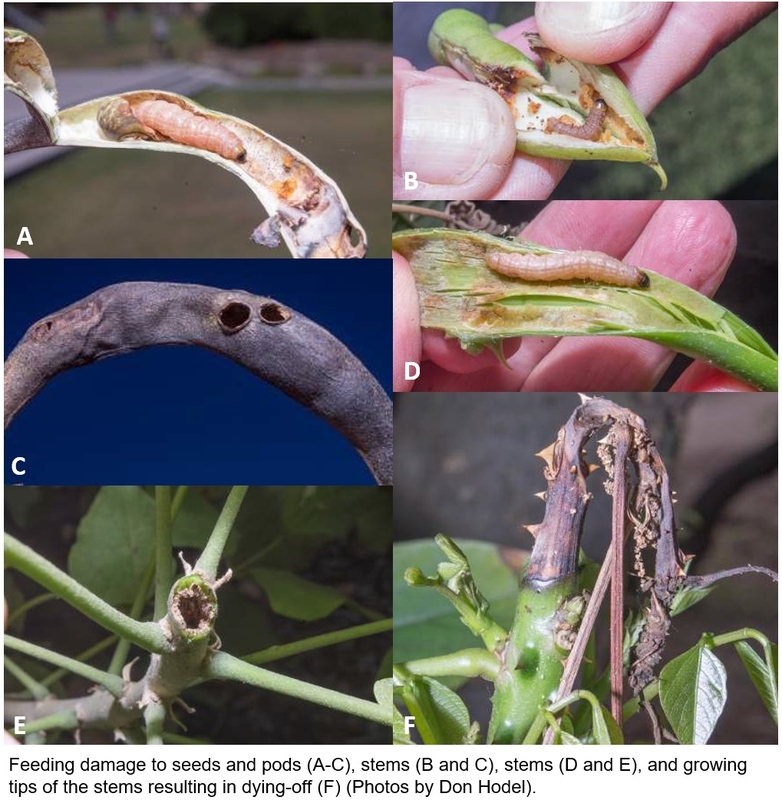 The Erythrina stem borer (ESB) (sometimes known as the Erythrina twig borer) (Terastia meticulosalis), a potentially devastating pest of Erythrina spp. (coral trees), has been sighted numerous times in southern California in the latter half of 2015 from San Diego to Ventura. Erythrina, a member of the Fabaceae (formerly Leguminosae, bean family) encompasses about 112 species (Bruneau 1996) and includes some of our most useful, valuable, well adapted, and spectacular flowering trees, adorning landscapes along the coast and adjacent plains and valleys in southern California. Indeed, a famous planting of E. caffra adorning the broad median of San Vicente Boulevard in Santa Monica and West Los Angeles was designated an exceptional planting (Hodel 1988). The plethora of sightings suggests a more recent introduction but the ESB was recorded as early as 1973 at Fort Piute in the California desert north of Needles near the southern tip of Nevada (CMSD 2016). The ESB is of special concern for us because so little is known about its management and it appears to be especially destructive on coral trees, infesting seeds, destroying branch tips, and even killing whole plants. In Florida where it is native, it is a serious pest of naturally occurring and exotic coral trees, which are valued for agriculture, medicine, and landscape ornament (Powell and Westley 1993). Indeed, the cultivation of exotic coral trees in Florida is essentially impossible because of the ESB (Raven 1974); the only coral tree that can be cultivated reliably there is the native Erythrina herbacea, which likely co-evolved with and is found over most of the range of the ESB. In California the ESB has been observed so far on E. × bidwillii, E. chiapasana, E. coralloides, E. crista-galli, and E. falcata; other species will likely be added in the future. Although much remains to be know about the ESB in California, at least at this early stage, the ESB seems to prefer species of coral trees with more lender stems and slender regrowth of larger-stemmed species. 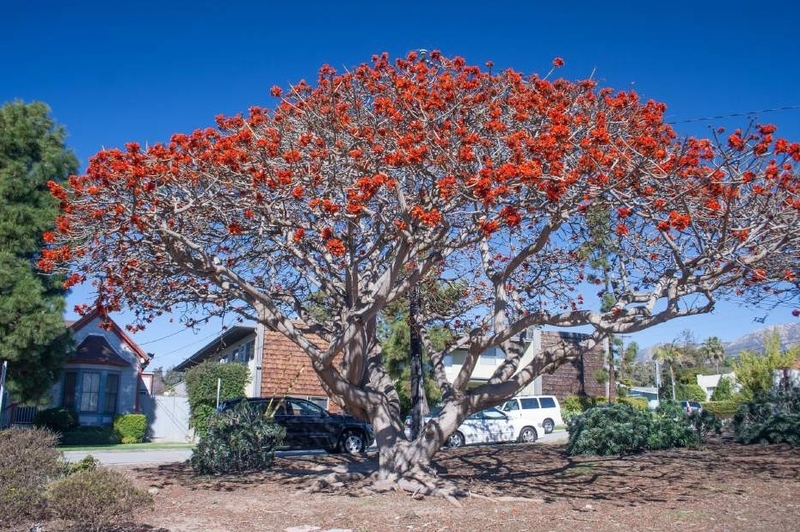 Fortunately, another serious pest of coral trees that is sympatric and co-evolved with the ESB, the Erythrina leaf roller (Agathodes designalis), has not yet been detected in California. 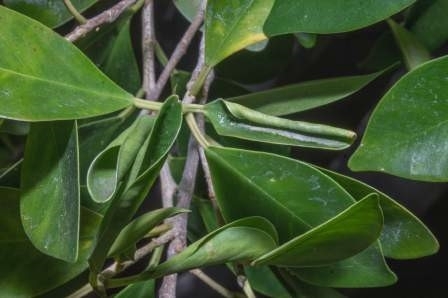 The Erythrina leaf roller and the ESB are in closely related genera that have tended to niche-partition the coral tree resource to reduce inter-species competition (Armstrong and McGehee 1980, Sourakov 2011). Much remains to be known about the natural history of the ESB, and the summary we provide here of its taxonomy, identification, distribution, and life cycle and damage it inflicts on coral trees is mostly from Arakelian (2016), Sourakov (2011, 2012, 2013), Sourakov et al. (2015), and our observations of infested coral trees here. The ESB is one of five species in the largely tropical moth genus Terastia, which ranges from the Americas to Africa, Asia, and the western Pacific (Sourakov et al. 2015). The ESB is the only species of the genus native to the Americas. The other four species are T. africana, T. egialealis (Africa), T. margaritis (India), and T. subjectalis (Asia and western Pacific). The adult ESB is a small-sized, brownish moth with mottled forewings and whitish hindwings with dark margins. Varying in size, adult forewing wingspans range from 2.5 to 4.6 cm, and the mottled body from 1.5 to 2.5 cm long, the latter with conspicuous knobs toward the posterior (Sourakov et al. 2015). In Florida the ESB varies greatly in size, which largely depends on the seasonal generation and diet. The spring generation, which feeds mostly on seeds, is larger than the fall and summer generation that feeds inside of stems. For example, wingspans of the spring generation average about 3.7 cm while those of the summer and fall generations average about 3cm and 2.5 cm respectively (Sourakov 2011). When at rest, the mottled- or marble-brown forewings are effective at camouflaging the ESB but when the wings are spread the white hind wings are conspicuous. Males and females are similar but the latter has more beige-brown forewing markings. In live specimens, the knobby abdomen is held in a curved, upright position, mimicking a praying mantis head, which is possibly a deterrent to predators (Sourakov et al. 2015). 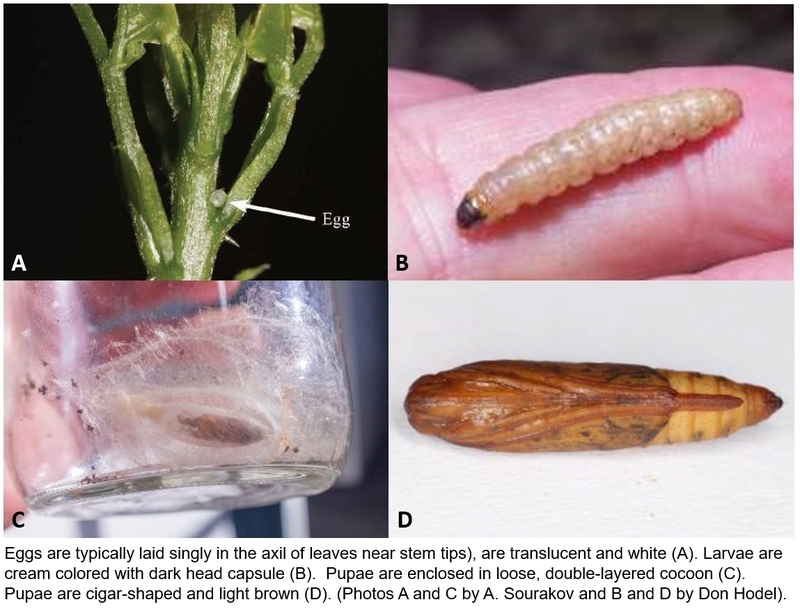 Eggs of the ESB, typically laid singly in the axil of leaves near stem tips, are translucent, white, delicate, dome-shaped with a reticulated surface, and about 0.8 mm long (Sourakov 2012). 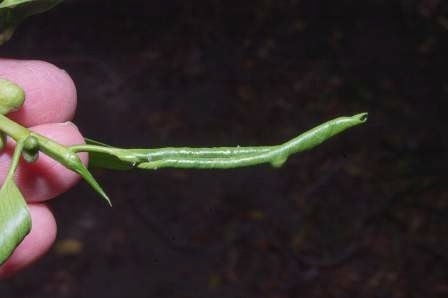 Young larvae are minute, about 0.5 mm long, and probably burrow directly into the flower, stem, or sometimes even a leaf petiole and then follow it to the stem. Larvae of the ESB are translucent and brownish white or cream-colored with a black sclerotized head and a dark sclerotized prothoracic plate that becomes lighter as the larva matures. Mature larvae are about 4 cm long. Larvae turn pinkish before pupation, especially when they complete their development on seeds. Pupae are cigar-shaped, light brown, and enclosed in a loose, double-layered cocoon (Sourakov 2011). Endemic to the Americas, the ESB occurs from South Carolina to Florida and west to Arizona (and now California) in the United States and south to Argentina. Although recorded from Hawaii (Swezey1923, Zimmerman 1958), this report is now thought to be misidentification. Numerous publications list it as part of African or Asian faunas, but that misconception has been recently clarified (Sourakov et al. 2015), and it seems to be a strictly New World species, with superficially similar but genetically distant relatives in other tropical regions. Larvae of the ESB likely emerge through the ventral surface of the egg and tunnel directly into the plant (Sourakov2012). The downward-boring larvae feed on stem tissues as they go, hollowing out the stem and causing a characteristic dying-off of stem tips, which turn black and sometimes collapse. The entire upper and lateral sides of the plant canopy can be killed. This damage acts like pruning, forcing out new lateral shoots below the damaged area; these, in turn, can become infested and killed. Entire plants can be killed although this can take up to several years. In Florida after killing off stem tips in the spring, the last instar larvae move into seed pods, a condition which appears to be less common in California so far. Feeding on the red seeds typically causes larvae to accumulate reddish pigments, changing their color to pink before they pupate. In contrast, summer and fall generations feed inside the stem and do not feed on the hardened seeds; thus, they are typically paler in color and do not take on the pinkish hue. Larvae typically purge the hollowed out stem of frass by crawling backwards to the entry hole to defecate (Sourakov 2013). Full grown larvae descend from a silk thread to the ground and construct their cocoons in leaf litter to pupate. 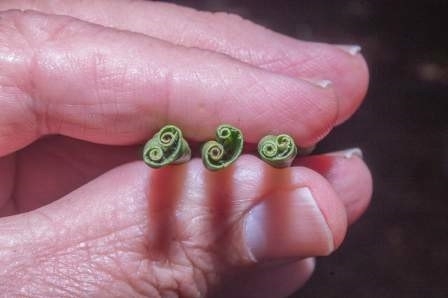 They have also been found in cocoons in old dead flowers at the ends of dead stems or inside folded up living leaves on the plant (Sourakov 2012). Adult ESBs are good fliers and can hover in flight similar to that of the Sphingidae (sphinx moths) (Sourakov 2012). This flight ability, along with larval endophagous feeding habits that provide some protection from predators, parasites, and abiotic mortality factors, largely explains why the ESB has been so successful in infesting Erythrina plants (Sourakov 2012). Unfortunately, next to nothing is known about the management of the ESB. Nearly all attempts at post-infestation eradication in Florida have failed. Virtually nothing is known about resident natural enemies although they must be present; until they are identified biological control holds little promise. 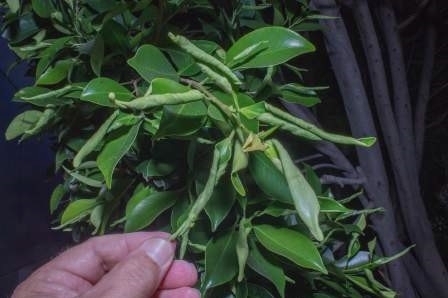 Perhaps vigilant scouting, judicious and immediate removal, bagging, and disposal of infested shoot tips, and ground and foliar treatment with systemic pesticides might be effective and justified for rare, exceptional, and/or noteworthy and valuable coral tree specimens. Because the ESB pupates in leaf litter on the ground, thorough raking and disposal of fallen leaves might reduce regeneration and provide some control. Cover/barrier insecticides, like pyrethroids (permethrin, cyfluthrin, bifenthrin) or emulsifiable concentrate formulation of carbaryl, might work well in killing of newly hatched larvae when they attempt to bore into the stems; although not yet tested for ESB, they have relatively long residual effects and might be effective. Further work is needed on this pest that poses a serious threat to California's ornamental landscape coral trees. We thank Andrei Sourakov of the University of Florida for reviewing this paper and providing some of the images. Readers interested in supporting his important work can contact Andrei directly (asourakov@flmnh.ufl.edu). Arakelian, G. 2016. Erythrina Stem Borer (Terastia meticulosalis). L. A. County Dept. Agri.Comm. /Weights Measures Pest Note. Armstrong, R. A. and R. McGehee. 1980. Competitive exclusion. Amer. Naturalist 115: 151-170. Bruneau, A. 1996. Phylogenetics and biogeographical patterns in Erythrina (Leguminosae: Phaseoleae) as inferred from morphological and chloroplast DNA characters. Syst. Bot. 21(4): 587-605. CMSD. 2016. California Moth Specimens Database. On-line: https://essigdb.berkeley.edu/cgi// calmoth_query?stat=BROWSE&query_src=eme_BrowseCalmothNames&where- genus=Terastia. Accessed 5 January 2016. Hodel, D. R. 1988. Exceptional Trees of Los Angeles. California Arboretum Foundation, Arcadia. Powell, M. H. and S. B. Westley. 1993. Erythrina Production and Use: A Field Manual. Nitrogen Fixing Tree Association, Paia, HI. Raven, P. H. 1974. Erythrina (Fabaceae): achievements and opportunities. Lloydia 35: 321-331. Sourakov, S. 2011. 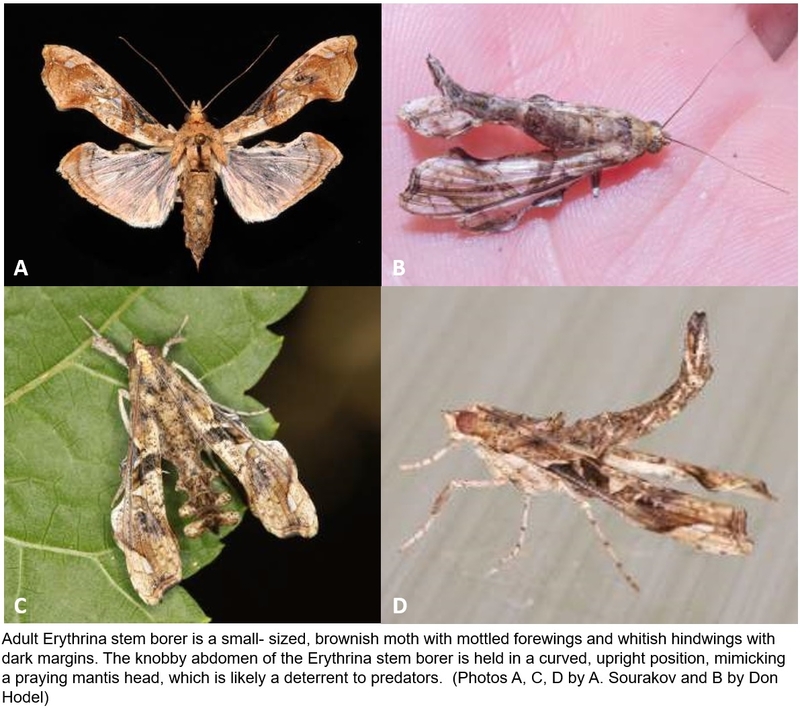 Niche-partitioning, co-evolution and life histories of erythrina moths, Terastia meticulosalis and Agathodes designalis (Lepidoptera: Crambidae). Trop. Lepid. Res. 21(2): 89-94. Sourakov, A. 2012. On the biology of moths that feed on Erythrina in Florida. Trop. Lepid. Res. 22(2): 110-118. Sourakov, A. 2013. Erythrina moths Terastia meticulosalis Guenée and Agathodes designalis Guenée. Department of Entomology, Florida Cooperative Extension Service, Institute of Food and Agricultural Sciences, University of Florida, Publ. EENY 516. Available on- line: http://edis.ifas.ufl.edu/in921. Sourakov, A., D. Plotkin, A. Y. Kawahara, L. Xiao, W. Hallswachs, and D. Janzen. 2015. On the taxonomy of the erythrina moths Agathodes and Terastia (Crambidae: Spilomelinae): Two different patterns of haplotype divergence and a new species of Terastia. Trop. Lepid. Res. 25(2): 80-97. Swezey, O. H. 1923. The Erythrina twig borer (Terastia meticulosalis) in Hawaii (Pyralidae, Lepidoptera. Proc. Hawaiian Ent. Soc. 5(2): 297-298. Zimmerman, E. L. 1958. Insects of Hawaii. Vol. 8 (Lepidoptera: Pyraloidea). University of Hawaii Press, Honolulu. Donald R. Hodel is landscape horticulture advisor for the University of California Cooperative Extension in Los Angeles. drhodel@ucanr.edu. James E. Henrich is curator of living collections at the Los Angeles County Arboretum & Botanic Garden in Arcadia, CA. jim.henrich@arboretum.org. 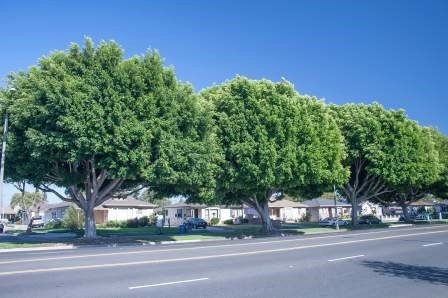 Kenneth J. Greby is an arborist with ArborPro in Yorba Linda, CA. fastfeat@gmail.com. Gevork Arakelian is the entomologist with the Los Angeles County Agricultural Commissioner/ Weights & Measures in South Gate, CA. GArakelian@acwm.lacounty.gov. Linda M. Ohara is a biology sciences lab technician at El Camino College in Torrance, CA, a horticulturist, and a former nurserywoman. lohara@elcamino.edu. Surendra K. Dara is Strawberry and Vegetable Crops Advisor and Affiliated IPM Advisor for the University of California Cooperative Extension, San Luis Obispo, Santa Barbara, and Ventura Counties, skdara@ucanr.edu. This article is a reprint of the original article published in the eJournal, PalmArbor. The UC Pest Management Guidelines Just Got Spicier! Whether or not your favorite team is playing in Sunday's big game, the Super Bowl is often a great excuse to gather with friends and family and enjoy some tasty treats! Maybe your favorite snack involves chips with salsa or guacamole, or perhaps you prefer shrimp with a delicious avocado dip. Whatever your snack of choice, chances are that you might spice it up with a little cilantro or parsley. Cilantro and parsley growers have something else to be happy about – The UC Statewide IPM Program just released new Pest Management Guidelines for Cilantro and Parsley. 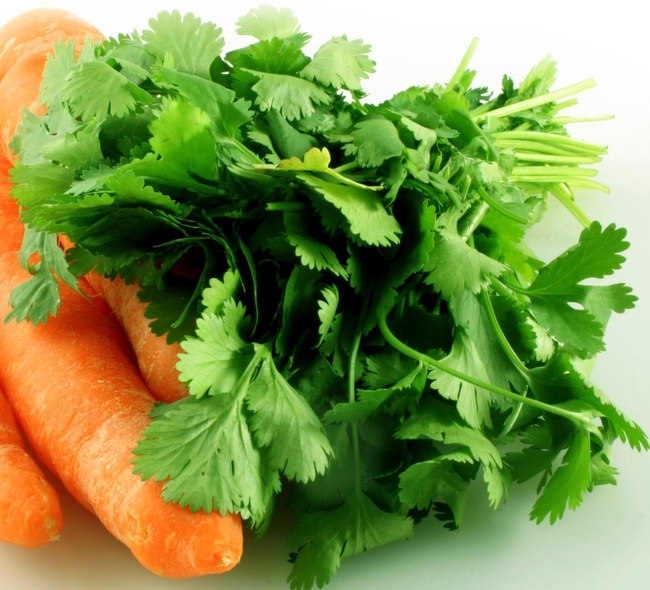 Cilantro and parsley are herbs used both fresh and dry for preparation of many popular dishes in almost all parts of the world including California. Apart from their pleasant flavor, both plants are also known for a number of nutritional and health benefits. In California, cilantro and parsley are grown commercially on more than 7,000 acres, primarily along the southern and central coast. Cilantro (also known as Chinese or Mexican parsley) and parsley are examples of specialty vegetable crops important in crop rotations and in contributing to California's overall agricultural diversity. Although pest problems aren't too common for home gardeners growing cilantro or parsley, for commercial growers, crop damage due to insect pests and diseases may be devastating and cause important economic losses. The new UC IPM Pest Management Guidelines for cilantro and parsley provide pest and management information for insects pests (including beet armyworm, cabbage looper, and aphids), diseases (including apium virus Y, bacterial leaf spot, carrot motley dwarf, cilantro yellow blotch, Fusarium wilt, and septoria leaf spot), and nematodes. Because weed management costs can be very high in cilantro and parsley unless weed control programs are carefully planned and implemented, a comprehensive weed management section is also included. Check out the new guidelines and other pest management information on the UC IPM website.